The 2017 summer season of contemporary art in Florence began on June 2. This year’s city-led showcase is not a monographic edition but a collective one titled “YTALIA: Energy Thought Beauty. Everything Is Connected”. The exhibition, beginning with the main centre of Forte Belvedere, takes up residence in numerous museums and institutions all over Florence: the Palazzo Vecchio, Boboli Gardens, Palazzo Pitti, Museo Novecento, Museo Marino Marini, Santa Croce and the Uffizi. The brainchild of Sergio Risaliti, the installations compare and correlate symbols of the Florentine Renaissance with works by Italian artists from the late 20th century, such as Mimmo Paladino, Marco Bagnoli, Alighiero Boetti, Gino De Dominicis, Domenico Bianchi, Luciano Fabro, Jannis Kounellis, Mario Merz, Nunzio, Giovanni Anselmo, Giulio Paolini and Remo Salvadori. 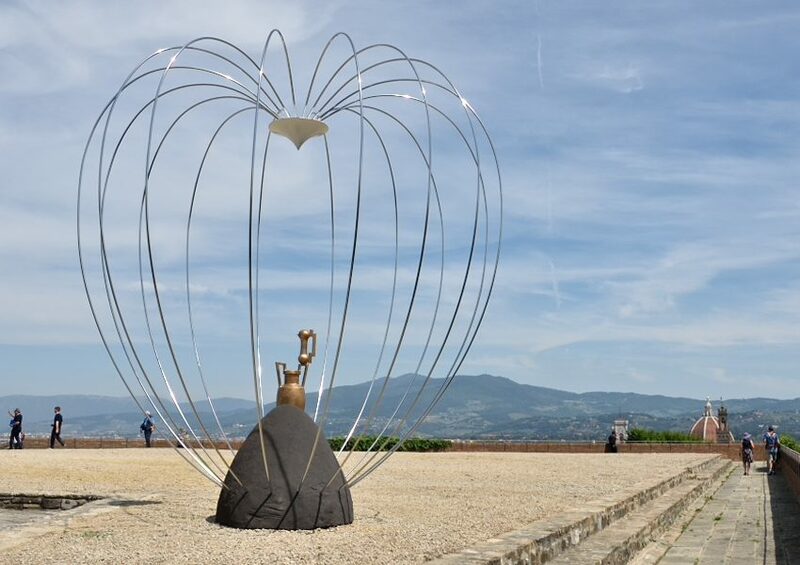 The core is at Forte Belvedere, where almost all the artists are represented by established works as well as a few new site-specific sculptures. Bearing in mind that everything up at Forte Belvedere is high impact in nature, there is no doubt that the star of the “Ytalia” show is the massive skeleton lying on the bastions. It makes me think, perhaps I’m exaggerating, of the effects of Stendhal syndrome that Florence’s beautiful artworks can have on visitors. Called Calamita Cosmica (Cosmic Calamity), the work is by Gino De Dominicis and has been exhibited on loan from the Fondazione Cassa di Risparmio di Foligno. The three words in the title of the exhibition—energy, thought, beauty—are the only way to interpret the works. Visitors do not need to go looking for a connection, or worse still a comparison, with the city’s Renaissance masterpieces. All you require here is piqued interest and a healthy dose of curiosity to listen to what contemporary Italian art has to tell us.